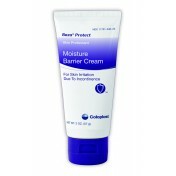 Baza Cream Antifungal Moisture Barrier, manufactured by Coloplast, treats topical fungal infections like jock itch, ringworm and athlete's foot. Patients suffering from these fungus infections typically experience pain, itching, burning and discomfort. Antifungal Products are designed to treat the infection site, speed up the healing process and keep the infected area dry. Fungus thrives in a moist environment which can aggravate fungal infections and cause them to spread. When fungus spreads it can cause a small irritation to turn into a big problem. Baza Cream Antifungal Moisture Barrier is available for sale from Vitality Medical and is designed to block the moisture and keep the infected area dry preventing further growth and spreading of the fungus infection. Pain and discomfort from fungal infections can be quite annoying, a good remedy to these irritations is the use of skin care products with conditioners and treatments to soothe redness, itching and burning. Eliminating these issues can make a fungus infection more manageable and faster to heal. Baza Cream Antifungal Moisture Barrier contains skin conditioners to soothe painful symptoms and zinc oxide to treat burning and itching associated with fungal infections. This product also contains 2% of miconazole nitrate. This active ingredient kills the fungi from the infection preventing further growth and painful aggravation so the infected site can heal. BUY Baza Cream Antifungal Moisture Barrier from Vitality Medical today. This product is awesome! After spending a fortune on ointments and creams to clear up a fungal rash, this worked almost immediately. Combined with the Remedy No-Rinse spray, all affected areas are cleaned and left refreshed after each use. Wonderful! This cream has been instrumental in clearing up a nasty skin condition due to wetness and subsequent fungal issues. Continued use has maintained this area fungal free. A great source of relief for what had been a chronic problem and a source of great discomfort. I will highly recommend this to anyone. This is a really good cream,I first used it in the Hospital when I was there over 4 years ago and have used it ever since.Thank you for sending so fast will definitely buy again.. So far this product has helped me where others have failed. The cream seems to form a moisture barrier that allows the Miconazole Nitrate to work to clear up the fungal infection without the use of powders. This was very helpful to me and the "dust level" in my room and house. I can't say enough good about this product. It is fantastic! I've been using Baza cream as a preventative barrier under my wafer (ileostomy) for nearly 7 years now, and I haven't had any fungal problems since. It's non-greasy and easy to apply and rub in. I got to have fungal infection on my skin and it was pretty painful. I have tried several different kinds of cream and I will stick to this one because it worked the best for me. I like everything about it. Texture, scent and etc. So soothing and mild.